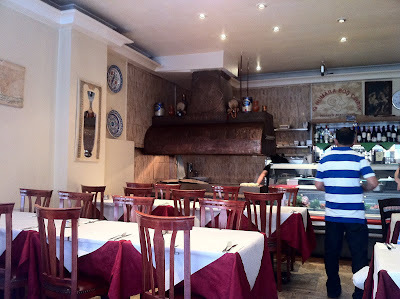 I don't know if you've noticed, and I daresay you haven't, but I've been on a mini-quest to find a Greek restaurant in London worth bothering with. At the risk of repeating myself, it makes no sense that just so many Greek restaurants in the capital are so bad - the cuisine isn't a million miles away from Turkish and there are more good ocakbasi than you would ever want, and the Greek community in London is equally long-established and successful. After a poor meal at Lemonia in Primrose hill, commenter Alex C thought that it might be simply that Greeks cook all their best food at home, and whether or not that's true (I've also heard rumours that Lemonia staff get fed exceptionally well, it's just the paying public that suffer), it's not really an excuse. London even has a smattering of good Mexican restaurants now, and there must be far fewer Mexicans making their way over the Atlantic than there are Greek Tavernas already up and running. The whole thing is baffling. So more in hope than expectation, I battled through the rain with a friend last week to Tsiakkos and Charcoal, subject of a number of healthy recommendations from various individuals and, given the pain of previous meals, our designated last shot at decent Greek food. And what a weird, ramshackle old place it is - inside is dark and chaotic, walls and counters covered with old cloth and junk piled up in the corners. Outside is even more bizarre - a courtyard containing old sofas and various statues, trinkets, road signs and other ephemera sheltering under corrugated plastic; it was like having dinner at Steptoe & Son's. 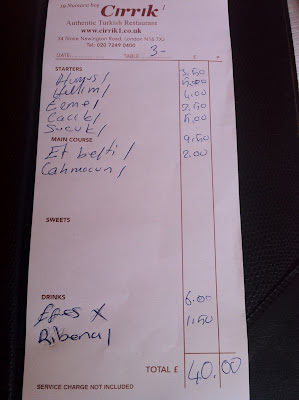 We ordered the 'mezze' (£20 a head but containing more or less most of the menu) from our friendly if slightly distracted waiter, and a bottle of £13 house Rioja. Things started well, at least. 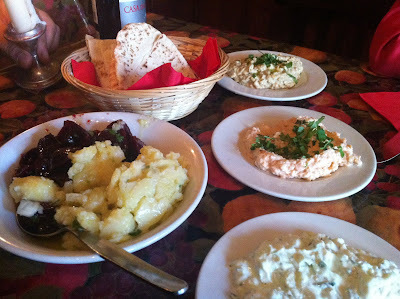 The cold mezze were all pleasingly rustic-looking, in fact I'd never seen hummus or taramasalata so chunky, and they tasted very good. Potato and beetroot salad, dripping in oil and garlic, was great, and although the pittas were bought-in (or at least felt like it) they did their job well enough. Tzatziki was straightforward but fine. Grilled halloumi were pleasant if unadventurous, but then grilled halloumi always is. 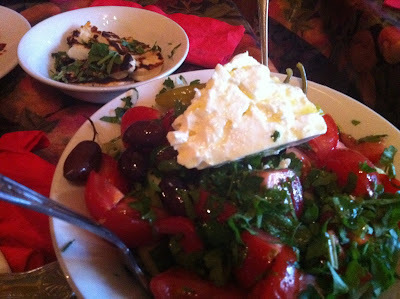 I was more disappointed with a feta salad, which despite having a huge fresh chunk of fluffy feta on top suffered from bog-standard tomato-and-rocket filler and was fairly unimpressive all said and done. Nice olives in there though. Lamb kleftikos was the best of the meat dishes, and although lacking a bit in spicing or seasoning made up for it by being lovely and crusty on the outside and oozily moist within. 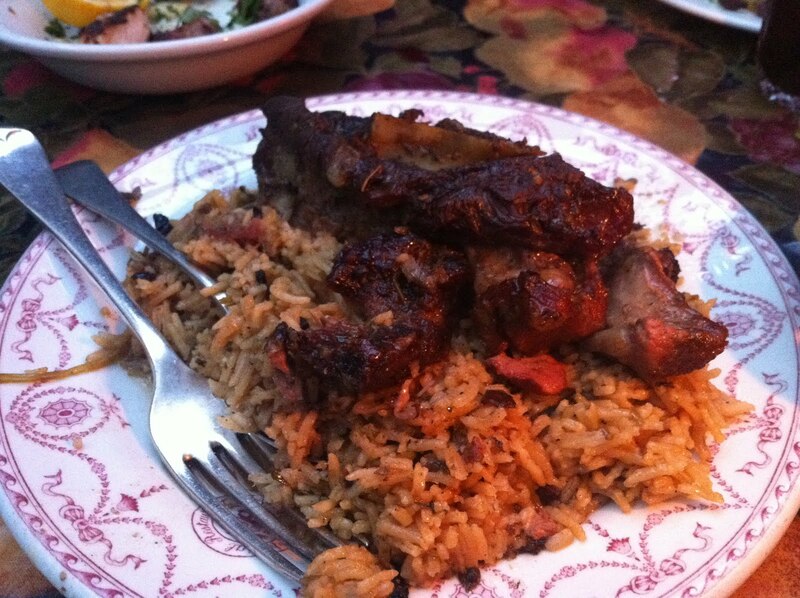 The rice it came with was hugely enjoyable too, cooked with the meat juices perhaps and full of flavour. Tsiakkos and Charcoal are so proud of their kleftikos, in fact, they brought out another one for us to try when we were hardly halfway through the first (actually this is a lie - it was just a miscommunication with the kitchen and a mistake). "Slow burnt pork" sounds like the kind of thing I'd ordinarily beat a path to anyone's door to try, but had unfortunately here been doused in a hugely oversweet marinade of some kind (honey?) and was quite sickly. We didn't eat much of it. 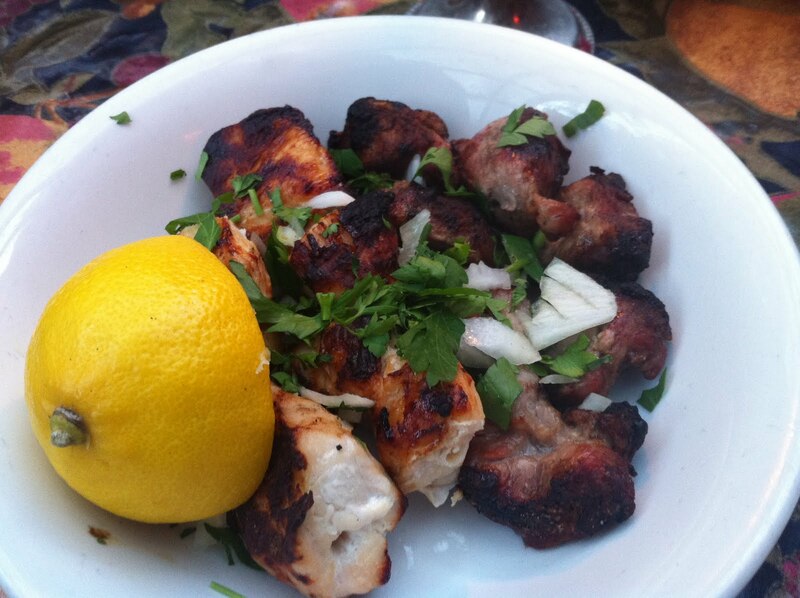 And chicken and lamb kebabs, though cooked properly and with good crusty skins, had next to no flavour at all. In fact, flavourless kebabs has been a bit of a feature of Greek restaurants in London generally - either they really do like their meat as bland as possible, or the quality of the raw ingredients back home means they can skimp on the seasoning and still enjoy a nice end result. It's presumably hard to get top-end chicken or lamb in London for £20/head. 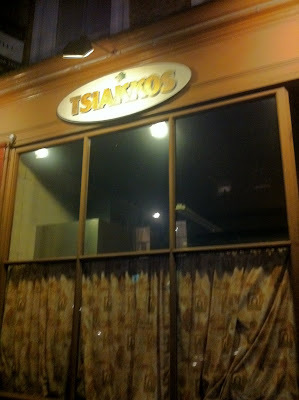 I will say this about Tsiakkos and Charcoal - there was a hell of a lot of food (not even counting the extra kleftikos) for your £20 and they refilled the bread without asking, so even though there wasn't much to shout about you still felt like you were just about getting good value. They also happily boxed up the bits and pieces we couldn't finish, so extra points for that too. But even ignoring the long journey into deepest Maida Vale (it's a good 20 minutes walk from the nearest tube), our meal wasn't quite either cheap enough (think - again - about all those amazing ocakbasi grills in Dalston which would be half the price) or exciting enough to be worth the effort. 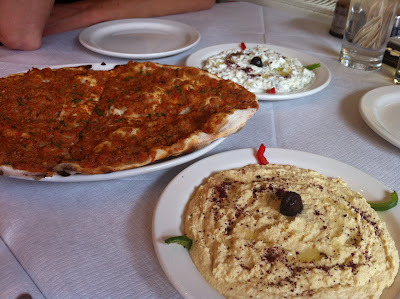 This may be deeply unfair to however many excellent Greek restaurants there are out there that have yet to feature on this blog, but I have a suspicion that Tsaikkos and Charcoal may, in fact, be as good as this food gets in London. Perhaps what we need is a restaurateur that will do for Greece what Thomasina Miers did for Mexico or Russell Norman did for Venice - to showcase a greater variety of those cuisines in an affordable and accessible way, served with a smile and an attitude. In fact, according to Daniel Young commenting on the Lemonia post, we may be about to get just that, as Theodore Kyriakou, original founder of the Real Greek long before it went downhill, returns to do business in London once again. But until then, we have Tsaikkos and Charcoal – it’s not perfect, but I just don’t have the time, the money or the capacity for disappointment to keep looking for anything better. 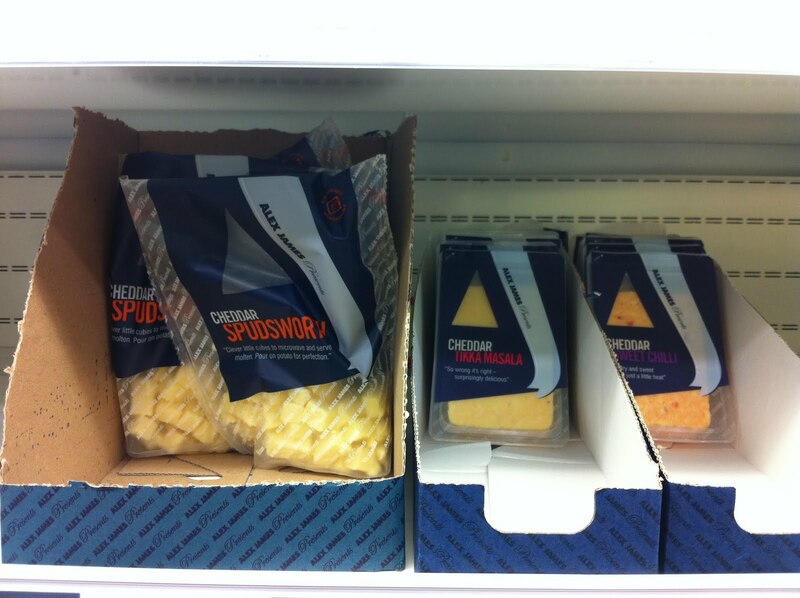 Cheese is at once our most revered and most abused foodstuff. At its best, as earthy Comté, pungent Epoisses or creamy Roquefort, it is one of the finest gourmet products on the planet, and available in such an unimaginably vast range of styles it's sometimes hard to believe they all come from the same raw ingredients - namely cow's, sheep's and goat's milk. Fine cheeses grace the tables of the world's best restaurants, take centre stage at the fanciest dinner parties, lift any picnic. Good cheese is one of the gastronomic wonders of the world, and my love for it is deep and profound - even the memory of the stunning Reblochon I had at Galvin @ Windows last week makes me go all wobbly. Of course, there is the other end of the scale. I'm going to ignore things like Cheeze Strings and Dairylee Dunkers and Primula spread because they have as much in common with real cheese as a Pot Noodle does to a bowl of ramen and aren't worth getting annoyed about. And I'm not, at least I try not to be, a cheese snob - not every mouthful has to be some unpasteurised, artisan delicacy from deepest Limousin, and there's a place for affordable cheese just as much there is any other type of food (apart from meat perhaps, but that's another argument). I'm as guilty as anyone of indulging in a bit of mass-produced protein from time to time; sometimes there's nothing better than some budget Red Leicester melted onto toast, or even a cheeky spread of Philadelphia on a cracker as a late night snack. But I wonder how many people who pick up a pack of Cathedral City on their weekly shopping trip would realise just how far what they know as "Cheddar" is removed from the amazing Keen's or Montgomery's versions. In short, cheap mass-produced cheese may be normal, it may even be necessary, but it needs to be seen in context, and I can't think of any artisan cheese makers who would willingly muddy their brand by at once producing small-batch, hand crafted cheeses at the same time as supplying the largest supermarket chain in the country with mass-produced, processed junk. Alex James does, it should be said, put his name to some proper cheeses. Little Wallop is a washed-rind goat's cheese that has won a few awards in various competitions (including, er, one his business partner organises) and his Blue Monday is by all accounts very nice too. There are rumours that he doesn't really have much to do with the business of actually making them other than giving them his stamp of celebrity-gilded approval, but in a way this is unimportant - having a high-profile champion of artisan cheese is to everyone's benefit and raises awareness generally. What isn't to anyone's benefit is to use this privileged position to launch a range of pre-sliced, artificially-flavoured crap in a naked attempt to make a bit of easy cash. Ladies and Gentlemen, available at an ASDA near you now, I give you, Alex James Presents. For whatever reason, I could only find the Cheddar Tikka Masala and Cheddar Sweet Chilli at ASDA Battersea. I went looking for them on the day they were supposed to have launched too, so I hope to God they hadn't already sold out of the Cheddar Ketchup and Cheddar Salad Cream versions otherwise my faith in the great British public may never recover. 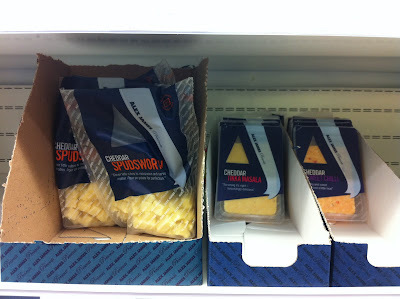 They were nestled on the shelf next to something called Alex James Cheddar Spudsworth, pre-sliced cheddar cubes that you're supposed to microwave until it turns into a bag of hot melted fondue and then pour onto a jacket potato. Because, you know, grating your own cheddar onto a potato can be such hard work. 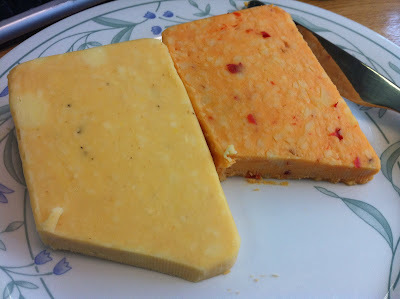 I hate novelty flavoured cheese at the best of times - whoever first came up with the idea of putting chunks of dried apricot in lovely Mrs Kirkham's unpasteurised Lancashire needs a stern talking to - so I eyed the lumps of red chilli in the Cheddar Sweet Chilli with great suspicion. It tasted just as you might expect cheap cheddar mashed up with sweet chilli sauce might taste - not inedible, just confusing and pointless. Cheddar Tikka Masala was more actively wrong, the tikka flavouring sitting on top of instead of combining with the cheese, and making a mistake of the whole idea. The cheese itself had an unexciting but not wholly bad creaminess - I've certainly had worse cheddars - but the texture, thanks presumably to the technique required to mix the ill-advised additives in properly - was cloying and pasty. Perhaps either of them would have been better on toast. I'm sure I'll never know. 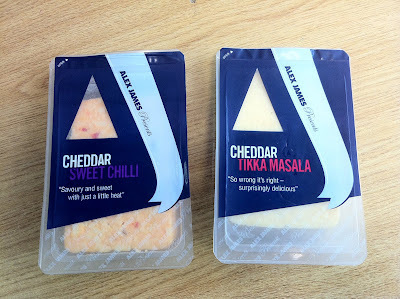 But my issue with Alex James Presents isn't that it tastes bad; I would never choose to buy Salad Cream Cheddar but I'm sure there are plenty of people who will, and at least there are no E-numbers or preservatives in it. My issue is that here is a wealthy man who had all the time and money in the world to produce something worthwhile, a man clearly passionate about good cheese who has already gained a reputation as a charming spokesperson for the industry, lending rock and roll glamour to an occasionally obscure process and bringing artisan cheese to the attention of many people who would otherwise have never have even considered it. And now, instead of using this power for good, he has sold out in the most dramatic way possible, by putting his name to a bastardised commodity boil-in-the-bag slop and range of novelty sandwich toppings in return for yet another hefty income stream. And the idea of that makes me more sick than anything involving pre-sliced triangles of ketchup-flavoured cheddar. Puschka, it has to be said, is a rather unusual name for a bistro on Rodney St, Liverpool, serving locally-sourced British food. We asked the owner about it, and apparently it was a pet name for a friend of theirs who helped them decorate - "We saw all the other restaurants in the area called things like 60 Hope Street and wanted to stand out". I suppose I can sympathise, but I still think "16 Rodney Street" would have spoken more eloquently of the style of food and vibe of the place, and not had people (like me) thinking I might find a menu of dumplings and vodka. 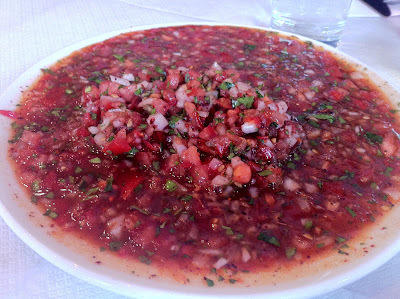 But hey, the decision has been made and Puschka it is. 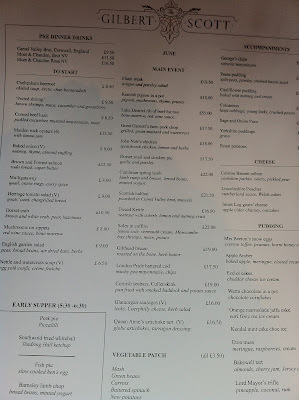 It's an interesting menu, thanks to the attractive-sounding dishes and ingredients (potted shrimp, soured mackerel, hake) but there are some quite punchy prices attached to them. I realise £7.50 for a goat's cheese starter or £17.50 for a trout main course isn't a fortune in the grand scheme of things, but for a fairly new (edit: Puschka is 10 years old! No idea what made me think it was new) restaurant in Liverpool it's a certain statement of intent. 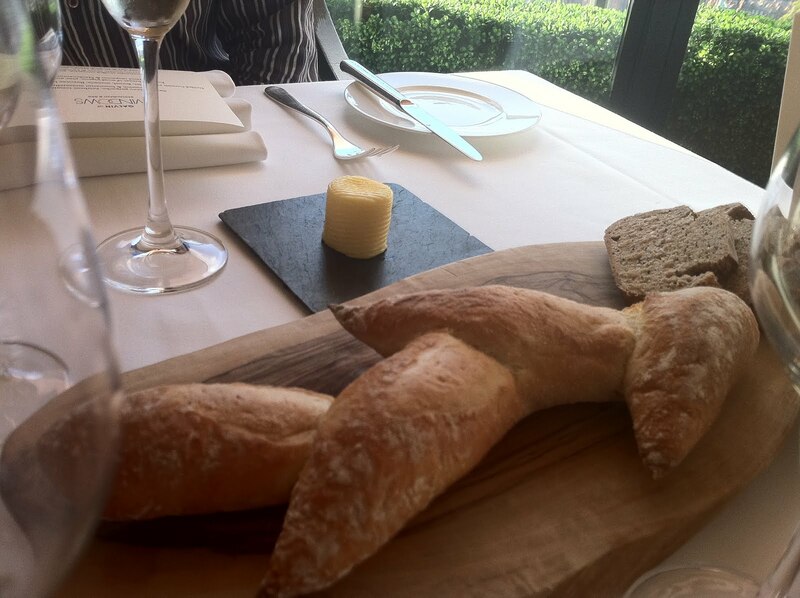 And you might expect house bread or nibbles of some kind to be included if you were spending the best part of £30 a head just on food, but not here - the long wait before the starters turned up (the menu did warn us that waits could be long in busy periods) only served to highlight the lack of these little extras. 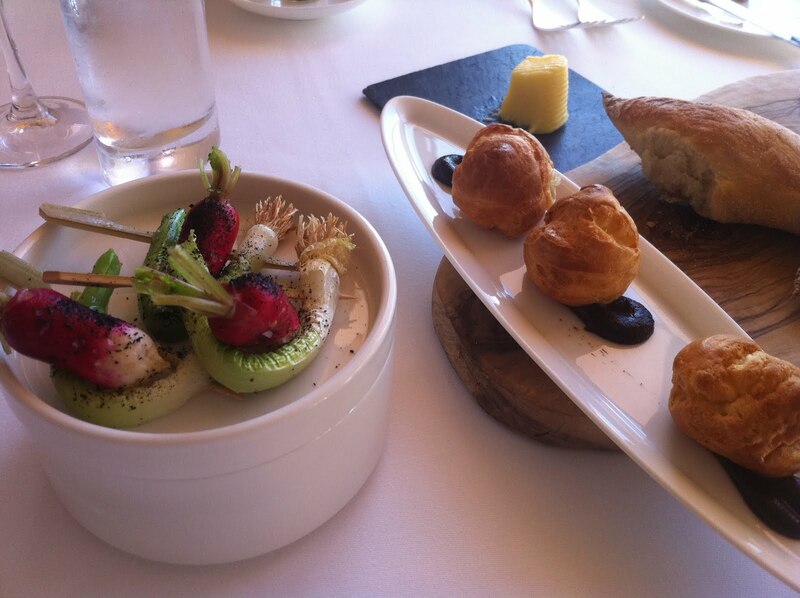 But, quibbles aside, when the starters did finally arrive they were very good indeed. My shrimp and crab arrangement was served with a freshly-baked loaf of rather collapsy but tasty bread (soda perhaps) and was very enjoyable - I particularly liked the fact the shrimp came from Southport instead of the more usual and further afield Morecambe Bay, although I can't really say they tasted any different. Chicken livers were huge and plentiful, soft and tasty and properly seasoned, the addition of some medjool dates working surprisingly well. Most impressive of all was a daily special of pigeon breast, served confidently rare and with a lovely gamey flavour. 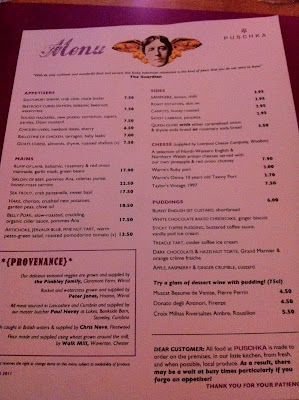 In the starters at least, Puschka's much-advertised sourcing (they proudly list all their suppliers in a special box on the menu titled "Provenance") seems to have been worth the effort. 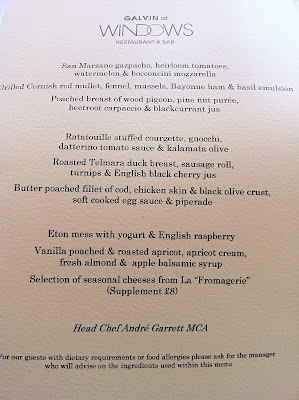 What a shame, then, that the main courses didn't reach the same level of quality. Best was the trout, which was a gut-bustingly generous portion, cooked to just slightly under in the middle and sitting on top of a huge salad containing lovely fresh crab. My duck, though, was verging on room temperature, underseasoned and lacking in flavour despite, again, there being a hell of a lot of it. 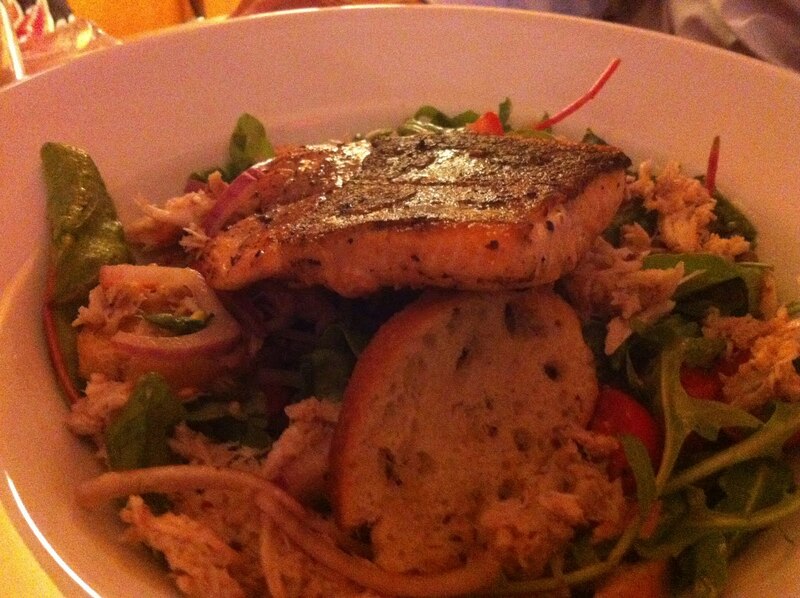 And finally, a daily special of tuna, ordered specifically because it was supposed to come with samphire, arrived without any samphire at all. When we pointed this out to our otherwise charming waitress, she shrugged "I don't know what the chef's playing at today". Well, it's kind of your job to know, actually. That's what we're paying you for. Desserts looked good; in fact, looking back, I'm not quite sure how any of us managed to resist the lure of the Sticky Toffee Pudding, but in the end we were full and reasonably content and so we paid the bill - £33 each or so with a bottle of excellent house white - and headed home. 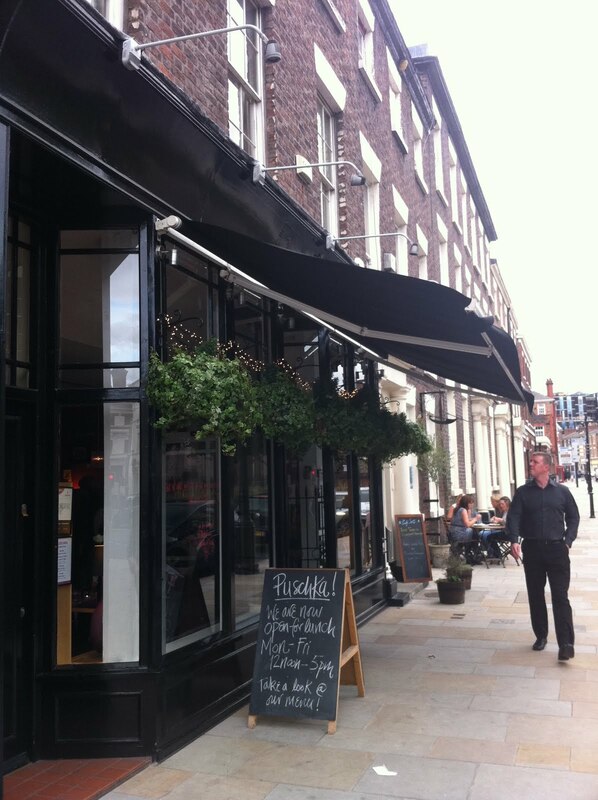 And although not perfect, Puschka still has enough to recommend it as a place to eat your dinner, although perhaps only if 60 Hope Street (just around the corner, very similar in price and quite a bit better) is full and you're not in a hurry to get anywhere afterwards. Judging by the boisterous, capacity crowd on Saturday night, there are more than enough people in Liverpool happy to make an evening of it. Up on the 28th floor of the Park Lane Hilton, nestled in a soft beige sofa, plied with cold champagne and nibbles, it's tempting to think you're somehow immune to life's problems. 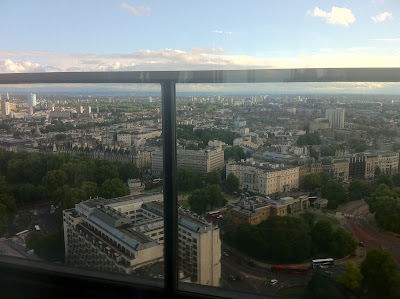 From this perch in the clouds, London is calm and quiet, the lush green of Hyde Park, the lines of traffic shuffling up and down Edgware Road, the rolling hills of Hampstead in the far distance - you're presented with an idealised version of the city, safe, serene, beautiful. 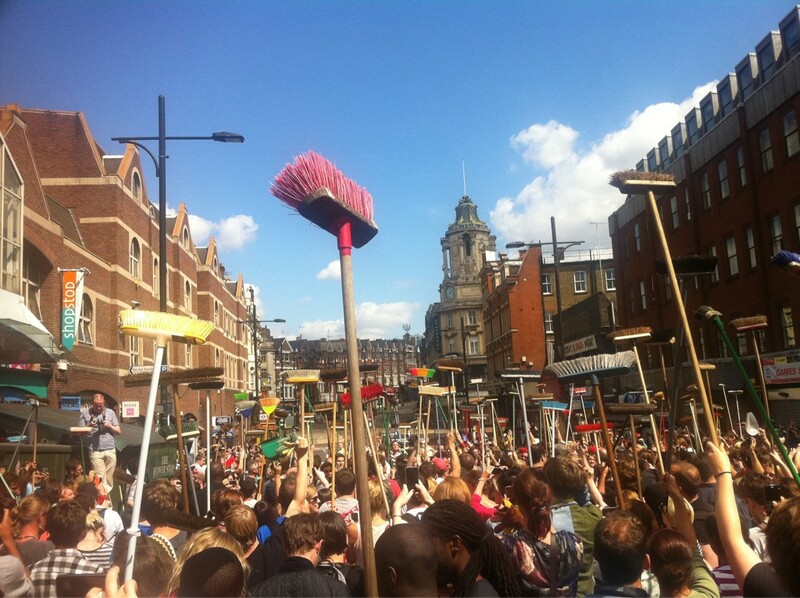 Unfortunately, events this week have revealed a side of the capital that are pretty far from ideal. I spent Tuesday night sat in the dark at the back of my house near Clapham Junction, kept awake by a combination of police helicopters, terrifying rolling news reports and the occasional distant scream, desperately hoping nobody would run out of estate agents windows to smash and instead turn their attention to my front room. 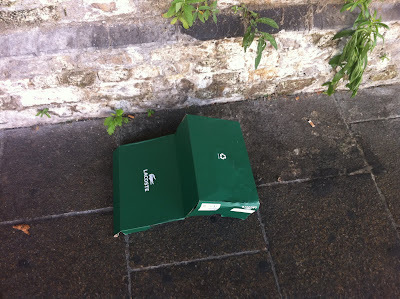 In the morning, the walk to work was strewn with discarded coat hangers and empty shoe boxes, and even before I hit the police cordon on Lavender Hill I'd passed numerous looted buildings. 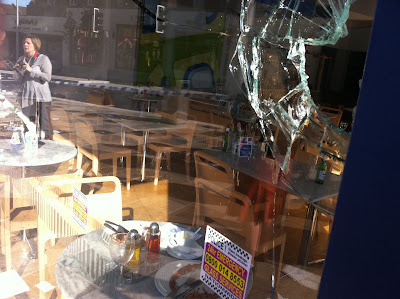 I was relieved that the lovely people at Mien Tay looked like they'd escaped the worst of it, though God knows what kind of evening they and their customers had, being so close to the violence. But it was the sight of a hastily abandoned meal still on the table amidst the broken glass at Pizza Express that was particularly traumatising. Nobody deserves that, not even people who choose to spend their evening in Pizza Express. 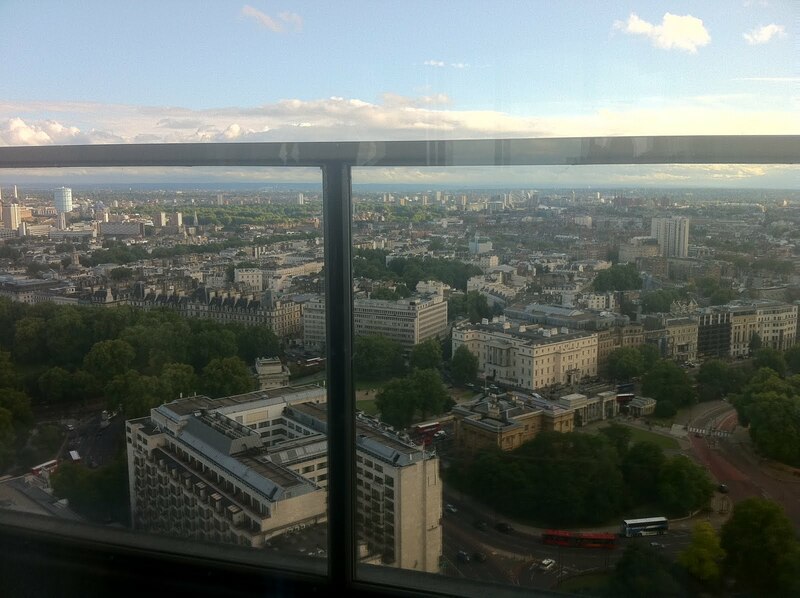 You could see the columns of smoke from fires in Battersea and elsewhere from Galvin @ Windows, staff told me last night. That must have been strange, trying to carry on as normal in their restaurant in the sky, knowing what was happening to their own houses and neighbourhoods as London broke and burned on the streets below. Some of the stories that emerged from that night are hideous, but it's never been truer to say that when times are hard, real heroes are born. People like the staff of the Ledbury, who fought off a mob with kitchen utensils and fat fryers, locked frightened guests in the wine cellar for safety, and refused payment even when grateful customers returned the next day and offered to settle up. 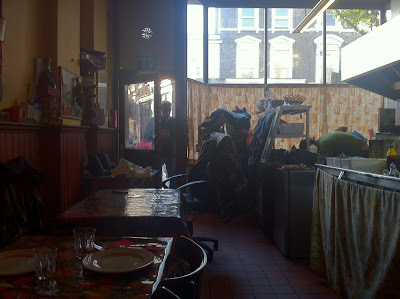 And people like the Turkish restaurateurs of Stoke Newington who instead of shuttering up and giving in, gathered their friends and bravely stood down the rioters using broken chair legs and cook's knives, their businesses - and dignity - protected. So, yes, it's been a funny old week, one that puts the silly business of writing restaurant reviews into pretty sharp perspective, and I'm not going to pretend I'm the least bit qualified to offer any commentary on the causes or solutions, or pontificate grandly on what it means for London or the UK that a significant minority of our population seem to have decided that there are no important repercussions to beating your way into Jessops and nicking an armful of digital cameras. It's unfathomable; I literally do not - probably never will - understand it at all, and so I won't try. 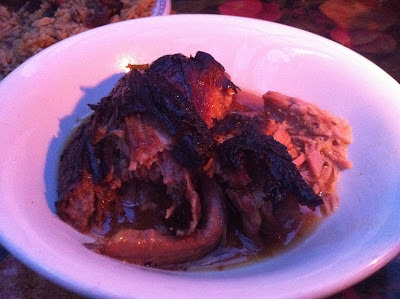 I'll just get back to doing what I normally do on this blog, and tell you what I had for dinner last night. 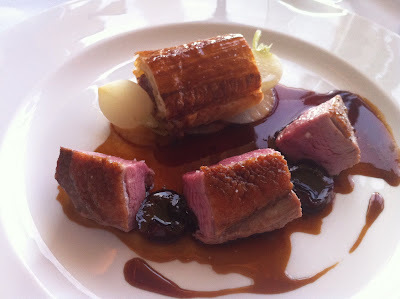 One of the reasons I find the food at Windows so interesting is that I've seen it, over the years I've been a very infrequent visitor, gradually morph from very traditional French haute cuisine to dishes that are far more recognisably English. 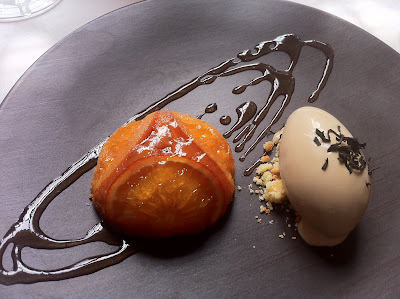 They still have a refined style and are immaculately presented in that way that the top French chefs know so well, but there's a refreshing lack of pretension and an honesty to the ingredients that is far closer to, say, L'Enclume and even St John than temples of French gastronomy like Le Gavroche. 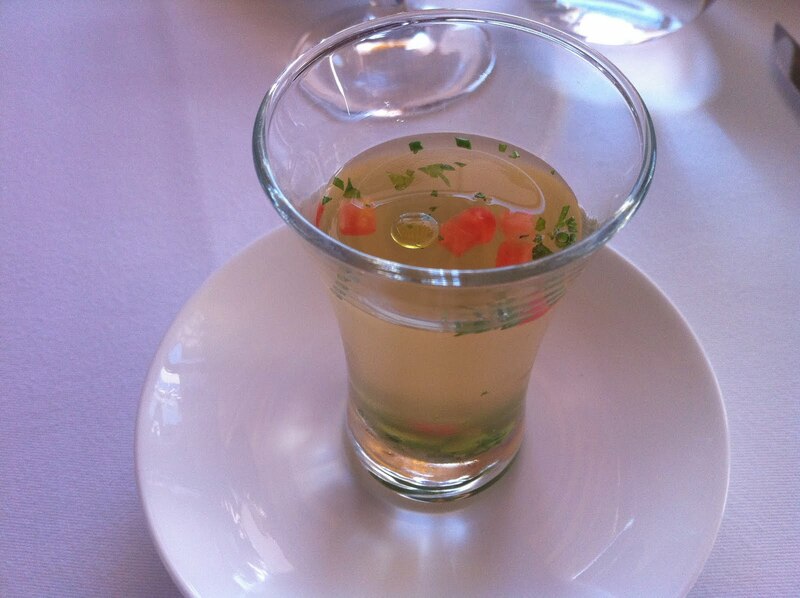 An amuse of vegetable consommé was fresh and well seasoned and clean tasting, not to mention looking very attractive, a light cheesy gougere on a chocolately olive paste matching the vegetable broth with rich pastry and dairy, but all the flavours were precise and familiar, just done very well. And I liked another canapé-style radish and spring onion bites dipped in sweet Romesco sauce, summery and colourful. 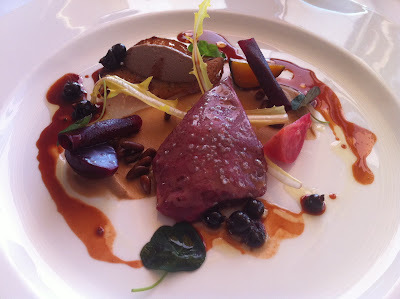 Pigeon breast, gamey and soft and full of flavour, was served with a dainty toast and paté of some kind and an artful smattering of beetroot rolls and sweet blobs of blackcurrant. What made this dish special though was a toasty slick of pine nut paste of some kind and roasted pine nuts, the earthy savoury flavour of the nuts adding a wonderful extra dimension. 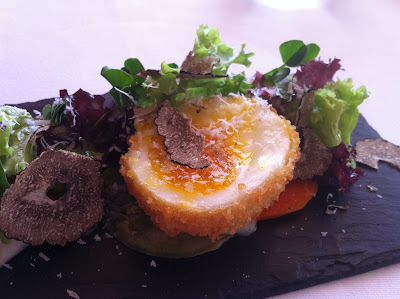 This truffle-fried egg was apparently an interloper from the full tasting menu, and was suitably decadently dressed in fresh sliced black truffle. Perfectly seasoned and timed to runny perfection, it made me think that Galvin should seriously consider entering next month's Scotch Egg Challenge at the Ship - wrap a bit of sausage meat around this chap and they'd be in with a real chance I'm sure. 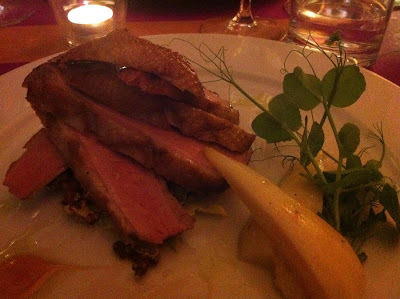 Main of Telmara (East Anglia somewhere apparently) duck was pink and delicious, as you might expect, served with soft cherries and interesting bitter white turnips. What really caught my attention though was a fancy gourmet sausage roll, powerfully herby with a dainty light pastry casing. A very successful mix of flavours and textures. A pre-dessert, another refugee from the tasting menu I think, was a blueberry and custard thingy with a topping of lime mousse. 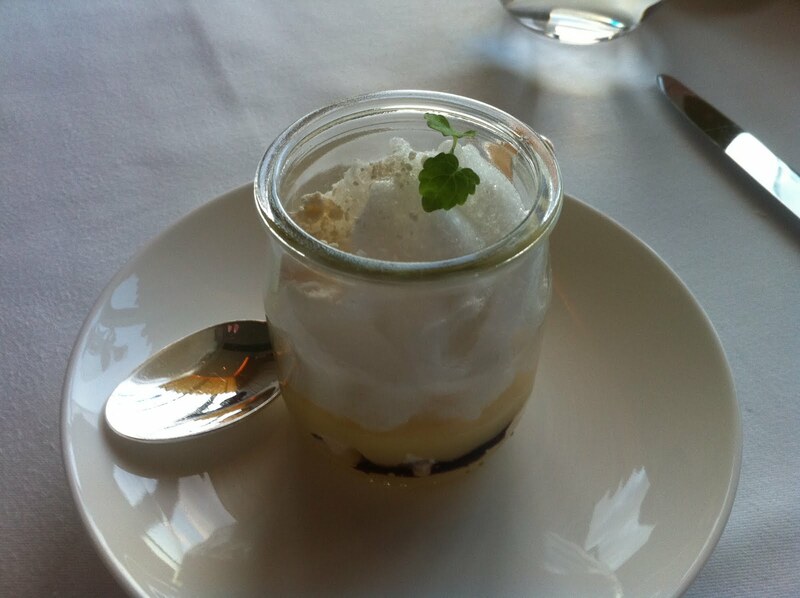 It was full of brilliant summer flavours, and although I perhaps could have done with a little more of a lime hit from the mousse, it still disappeared in happy seconds. 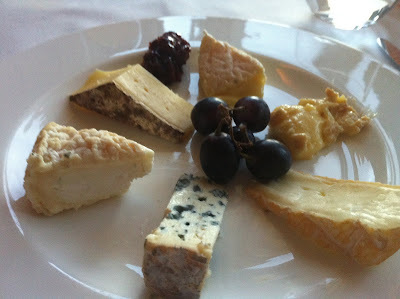 The cheese waiter at Windows explained that they had been "trying something different" with the cheese selection recently and had asked their supplier, La Fromagerie, for a slightly more experimental range. At first, in my blindly patriotic way, I was disappointed to learn they had just one non-French option, but they certainly all did look very interesting, and I barely recognised any of them which is always quite exciting. In fact they were all so new to me that I can tell you the name of just one - the blue Fourme d'Ambert at the bottom there - which was reliably creamy and gently salty. The star of the plate, though, was the one to its right, which I promise I will reveal once my investigations are complete. 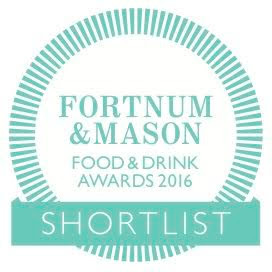 It was an extraordinary product, the only way I can describe it is that it was like eating a cowshed, powerfully natural and unpasteurised. I had been invited to Windows to try what they call the "Menu du Chef", which at £39 for three courses is pretty good value considering the location, the view, the service (so famously good they made a TV show out of it) and the quality of the food. And though I know nothing about wine and have long given up trying to say anything perceptive about it, our sommelier charmingly and carefully talked us through some really delicious wine pairings - I particularly liked the Pinot Noir that came with the duck, although I always seem to like Pinot Noir anyway. It was a genuinely lovely evening, not a foot wrong put by anyone front or back of house, a delight from start to finish. So, life goes on. It speaks volumes about the character of this city that on Wednesday morning, the day after the main period of troubles, the headlines were just as much dominated by the extraordinary residential cleanup operations organised over Twitter, and the spontaneous outpouring of community spirit as demonstrated by the Peckham Peace Wall as by securicam shots of hooded rioters and burned out buildings. If it takes a gang of disaffected troublemakers to shake our faith in the inherent decency of humankind then there are enough heartfelt campaigns like Keep Aaron Cutting and Help Siva to remind us all that actually, there are far, far more good people out there than bad. It's been a difficult week, but as I say, hard times often only bring out the best in decent, compassionate and civilised people. And I'm willing to bet that the true character of this city wasn't hiding under a hoodie on Tuesday night stealing trainers, it was up early the next morning with a broom along with thousands of others, ready to put things right again. Although I try to never approach a restaurant expecting it to be brilliant - there's only the inevitable can happen when you set your prospects too high - there was a part of me really hoping my meal at the Gilbert Scott was great. Then I could lead this review with the subtitle "Great Scott!" and go on to draw many tortured parallels between the painstakingly researched retro menu and the Back to the Future films. Actually, on second thoughts, perhaps it's a good thing it wasn't great after all. That's not to say there wasn't just about enough to enjoy. Worth a journey almost in its own right is a mooch around the fantastic and lavishly restored Midland Grand Hotel (sorry, I should say the St. Pancras Renaissance), the intricately painted high ceilings and gothic carved stone pillars making you wonder if this is what it might be like having lunch at Hogwarts. 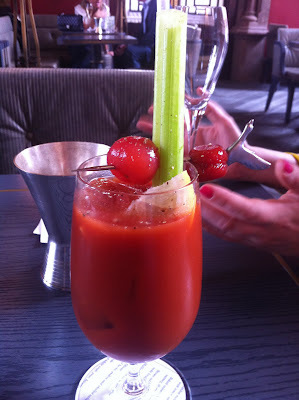 The first room you find yourself in is the bar, which produces cocktails every bit as impressive as the room - my Bloody Mary was powerful and tomato-y, and garnished with some kind of preserved or marinated cherry tomato on a metal cocktail stick shaped into a flying swan. Nice touch. And then through we went to the vast dining hall, stretching into the far distance in a gentle curve, framed by even more lavish gothic detail and 20ft high windows. It was a bit of a surprise in fact, given the huge space the restaurant architects had to work with, that so many of the tables seemed squashed so close together; we were sat in-between two other couples barely two feet away on either side, and the table to our right had their chairs arranged onto one side as if our meal was part of the afternoon's entertainment. I munched with practiced nonchalance on the (nice) house bread, all the time acutely aware I were being watched silently from the corner and trying desperately not to catch their eye. 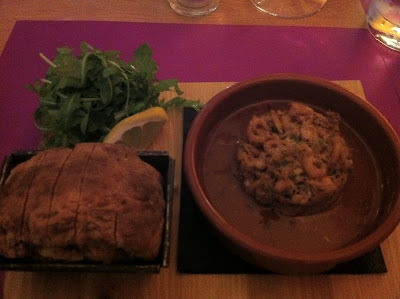 Starters were as good as you might find in a half decent gastropub, though not really worth the price tag. 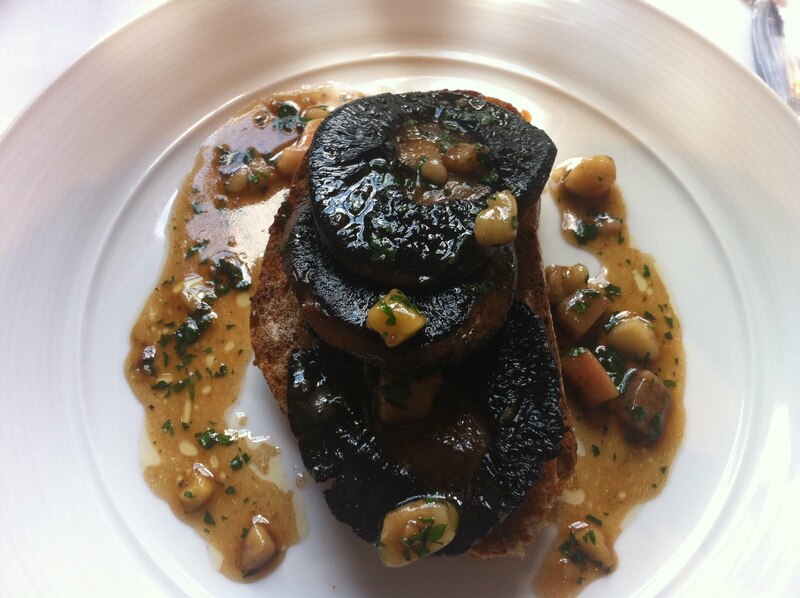 "Mushrooms on sippets" (£8) despite the eye-catching title was in fact just mushrooms on toast, edible but surprisingly bland for something containing huge chunks of bone marrow. 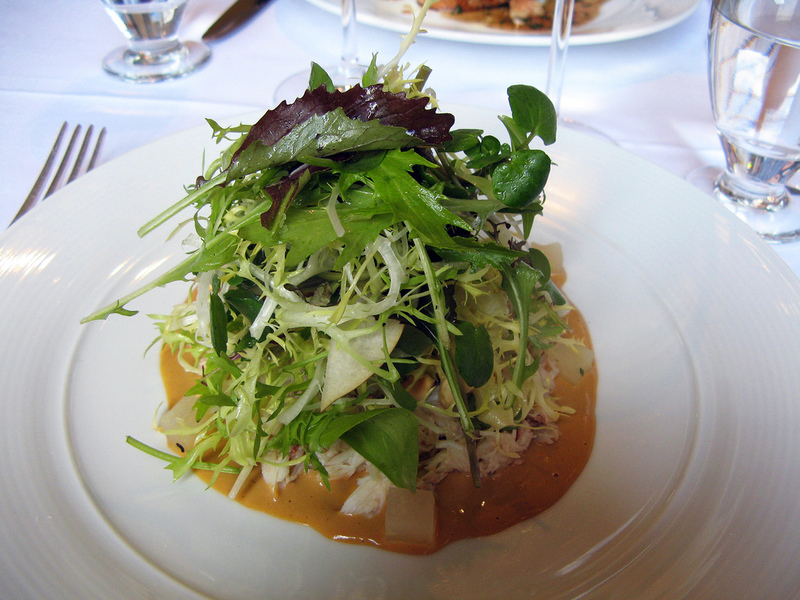 "Dorset crab, brown and white crab, pear, hazelnuts" (£10.50) was better, the crab in particular being brilliantly fresh and sweet and with a generous scattering of shrimp, but although we liked the addition of pear and hazelnut the huge pile of unseasoned rabbit food dumped on top needed dressing and seasoning. Even a squeeze of lemon would have lifted it. 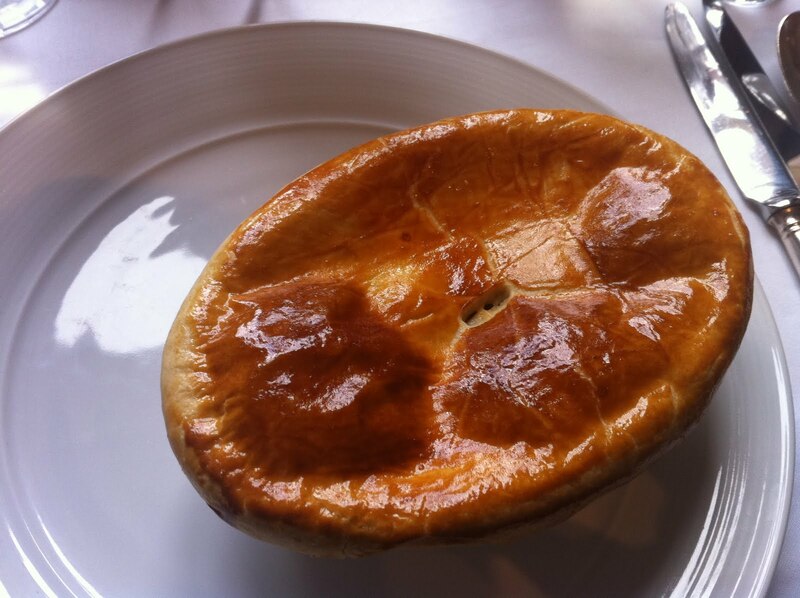 I enjoyed my chicken and snail pie (£17.50) although, again, you have to wonder about the price. It's a nice space to eat in and I'm sure the billions of pounds spent on this huge listed building need to be clawed back somehow, but really, this was a pretty small pie, only half filled with presumably cheap ingredients, and although having plenty of flavour and nice tasty pastry it didn't exactly feel like value. "Soles in coffins" (£22) was good, perfectly cooked, meaty lemon sole wrapped into little parcels (maybe these were the aforementioned "coffins") and with more very tasty brown shrimps and crunchy samphire. We couldn't taste any vermouth in the cream though, and despite the trendy retro title this was in the end a fairly straightforward dish. We had heard lots of good reports on the desserts at the Gilbert Scott, not least the "Mrs Beeton's Snow Egg" (£7), a sort of an Ille Flottante topped with crunchy toffee bits and containing a hidden cache of liquid caramel inside. 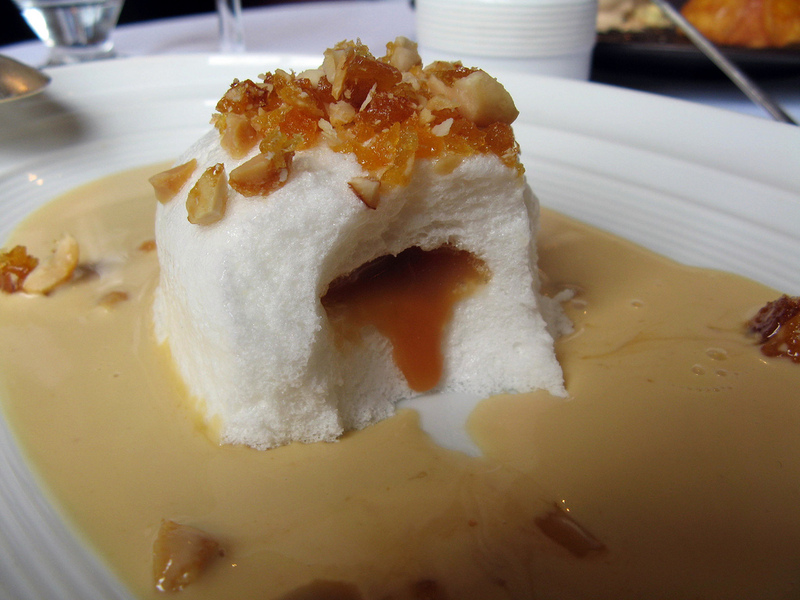 It was pleasant enough, not a great deal more than the sum of its parts, but there's still plenty to like even in a by-the-numbers Ille Flottante and the addition of the hidden caramel was a nice touch. Much better, in fact enough to push the overall experience up another mark out of ten, was a hilarious deconstructed "Jaffa Cake" (£7), with sharp slices of whole orange marmalade pressed onto a chocolate and biscuit dome and accompanied by a delicate scoop of Earl Grey ice cream. It was at once familiar to anyone who had scoffed Jaffa Cakes in their past (and I imagine very few British people haven't) and also fresh and inventive, a genuinely inspired dessert and one that had also presumably taken a bit of time to get right, and in contrast to the savoury courses, then, a remarkable bit of value. 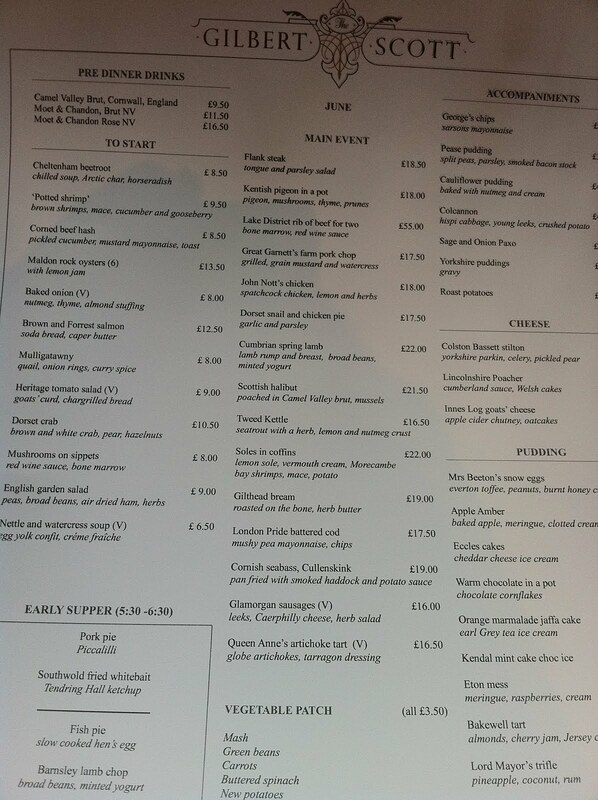 With a bottle of sharp £35 Austrian Grüner Veltliner and a single Armagnac taking place of a coffee or cheese course, the bill came to £154.75 for two. It's (sadly) not a fortune by central London standards and nowhere near as violatingly expensive as some other hotel restaurants (hang your head in shame Apsleys), but it still felt (with the exception of that Jaffa Cake dessert) like an unremarkable gastropub lunch taking advantage of its location to bump up the prices by 50%. Also, the bill included an item guaranteed to make my blood boil, a cover charge of £2/head which "covered" no more than two slices of OK bread and butter each. Service was haphazard, too - the staff seemed to congregate in nervous groups from time to time, furtively whispering amongst themselves, before splitting and dashing off into the corners of the room, all the while cleverly avoiding eye contact with any guests. 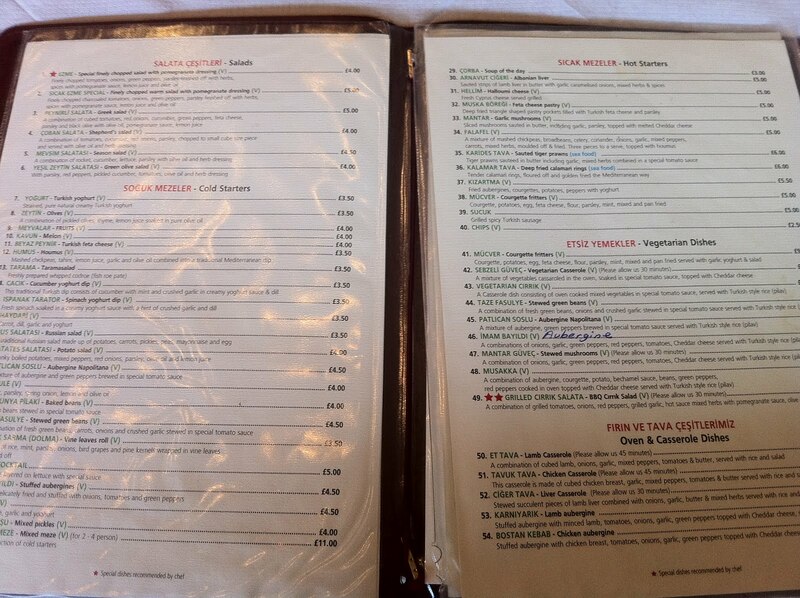 It took a great deal of time to track one down and pay the bill, although they were pleasant with it. I'd write it off as opening period nerves although the place has been opened over a month now and I can't see it improving a great deal further. 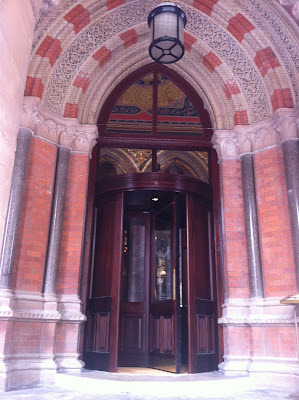 The Gilbert Scott is not a bad restaurant, and given the choice between this and any number of other horrible chains lurking up the road at Euston station, I know which one I'd prefer to have welcome people into London, or indeed sent happily on their way. 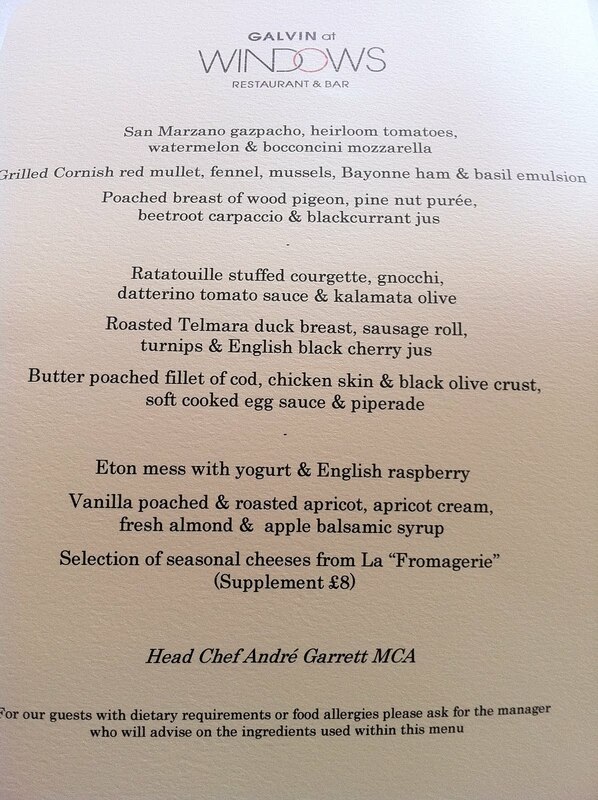 And I did notice an "Early Supper" menu served between 5:30-6:30 which at £24 for 3 courses is a slightly cheaper way of getting your fill. So maybe I'm just picking fault because I can, and because the mistakes are easier to notice than anything else, and not because there's anything here that would really put most diners off. In this glorious old building, in an area of London not blessed with much else worth spending your money on, it's doing a pretty good job. Not quite great, then, but perhaps good enough. Of all the internationally-renowned burger chains that I have my fingers and toes crossed for a London branch (Shake Shack, In'N'Out, Five Guys, to name but a few) it's probably fair to say the Hawaiian-themed Kua 'Aina wasn't too high up on the wish list. 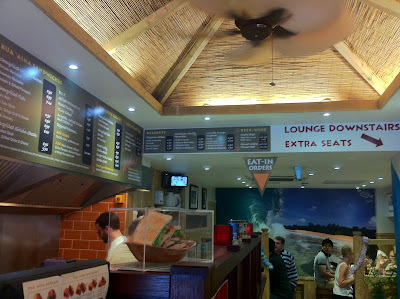 When I first heard the news of their arrival here, I did a quick scan of the website and concluded that anywhere you could order a pineapple and avocado burger with a straight face probably wasn't going to take anything very seriously, and put it to the back of my mind. 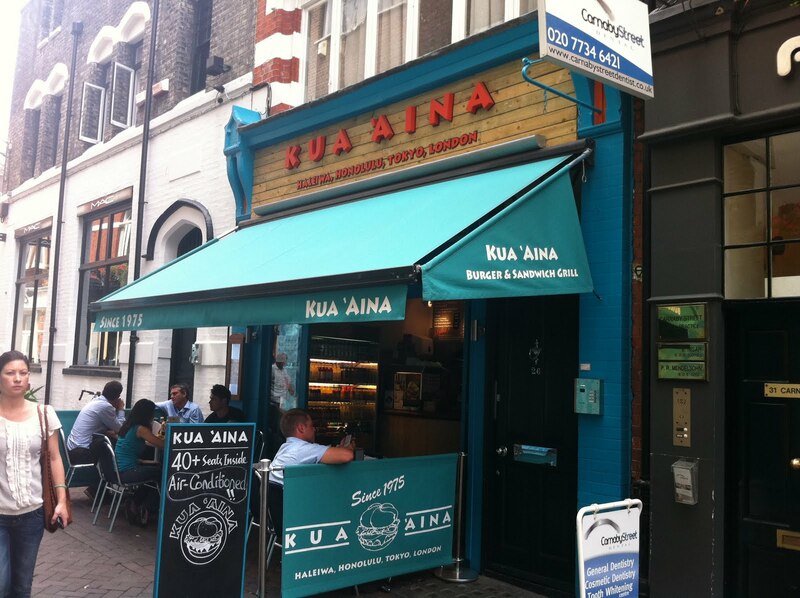 But with much the same attitude as my visit to Guerilla Burgers, namely "it's probably crap but at least it's a burger", I found myself in the brand spanking new Soho branch of Kua 'Aina and I'm happy to report that, despite the proto-chain feel and the existence of pineapple and avocado on the menu, it's really rather good. "Anything you can think of we can make" boasted the waitress taking our order, perhaps overstating reality slightly but it still showed an enthusiastic desire to please. If I'd wanted to hate the place I may have indeed gone for something involving pineapple and avocado, but believe it or not my desire for a nice lunch was greater than that for any kind of schadenfreude-laden writeup, so we ordered a Bacon Cheeseburger (with Swiss cheese) and my friend had a standard cheeseburger (with Monterey Jack), with a large portion of fries to share. It was only when we'd found a cave to call our own in the strange labyrinth of nooks and crannies downstairs at Kua 'Aina that I began to think that perhaps there was more to the place than the tacky Hawaiian-theme suggested. 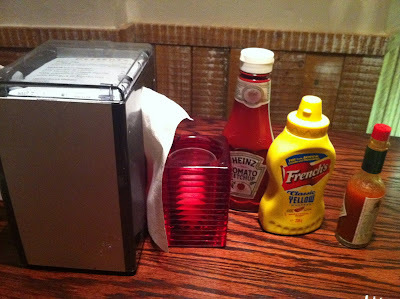 For a start, the selection of condiments was absolutely spot-on - Heinz ketchup, French's mustard and Tabasco, all bases covered and everything as it should be. And I was also heartened to see that other diners' food was being brought in plastic bowls lined with greaseproof paper - a terribly nerdy thing to notice perhaps but I honestly don't think there's any better way of serving burgers. As you can most likely tell even from the photo, there is plenty to criticise about the Kua 'Aina bacon cheeseburger. That... thing on the left is a thick grilled slice of onion, which unravelled on eating into long, slimy worms and provided nothing but irritation. There on the right is far too much salad, which I quickly dumped along with the slick of cheap mayonnaise. And yes, that in the middle is a carrot stick. No, I don't know what I was supposed to do with it. 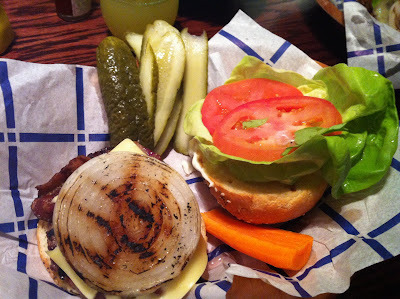 But relieved of the salad and put together and ignoring the onion (and carrot), the burger was actually very tasty. 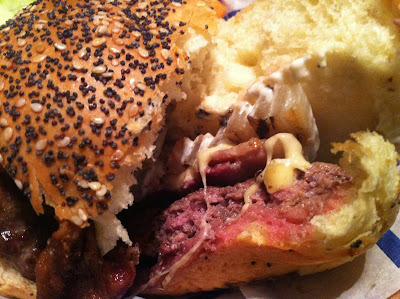 The beef was cooked perfectly medium and was as juicy as you'd ever want, the bacon was crispy and salty and provided good texture, and even the Swiss cheese (there was no Kraft option sadly) worked very well - melty and dense. The bun was a bit dry and I'd prefer pickle chips to sticks (ie. sliced horizontally rather than lengthwise), but I still couldn't help enjoying it. 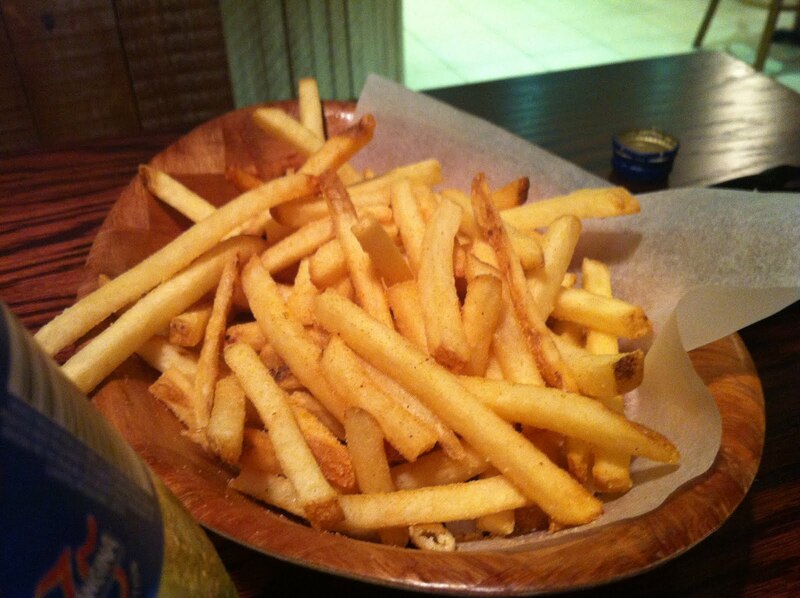 And the fries were excellent, crispy and salty and tasty right down to the bottom of the bowl. 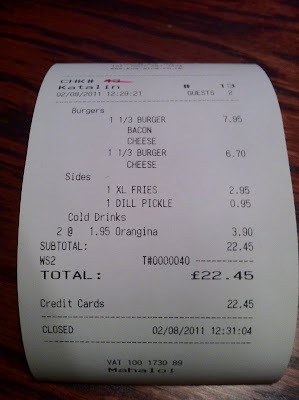 It goes without saying there are better burgers in London - even in this price range Byron probably has them beat, at least in terms of the burger itself - but you know what? There is far, far worse out there too. And given recent rants, the fact they aren't overcooking anything is cause enough for celebration. 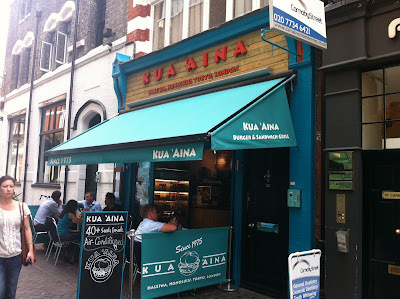 For the price and location, Kua 'Aina are just about punching above expectations, certainly my expectations, and despite the flaws, I really enjoyed my lunch there. I will almost definitely be back. On the one hand, this is going to be yet another blog post about a fantastic, ludicrously cheap Ocakbasi grill, and to that end, I apologise if it feels like you've heard it all before. Londoners are spoiled for decent Turkish restaurants in a way that almost no other cuisine can manage - some are better than others, of course, and I imagine it is at least theoretically possible to have a bad Turkish if you try hard enough, but there are just so many good ones scattered around certain areas of Dalston and Shoreditch that you'd have to be very unlucky to come away disappointed. 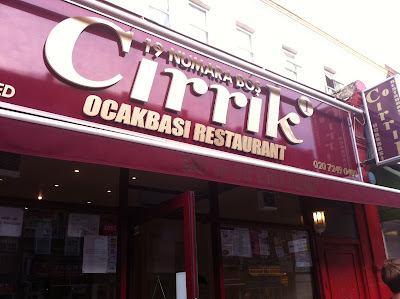 In one tiny stretch of the Stoke Newington Road there is the brilliant and ever popular Mangal 2, the unpronounceable but apparently very highly regarded Istanbul Iskembecisi, and the cryptically titled 19 Numara Bos Cirrik I, where I spent a thoroughly enjoyable Monday evening. You know there is some real talent in a kitchen when even something as straightforward as house hummus draws gasps of approval. It was, in fact, the finest example of this humble dish I've had in a very long time - light and smooth, seasoned perfectly and astonishingly fresh. 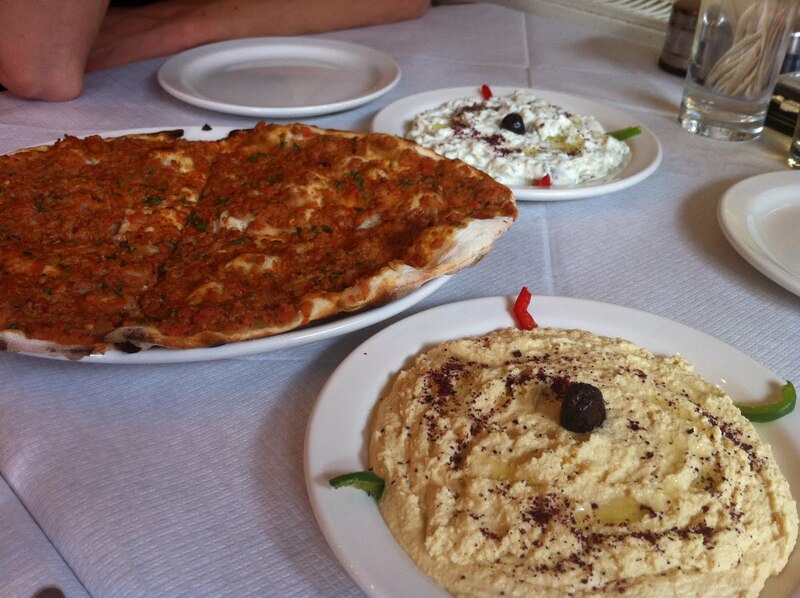 A generous round of lahmacun (sort of a Turkish pizza for want of a better description) was straight out of the oven and lovely and crisp, and cost a pathetic £2; amazing value. And even a plate of yoghurt and cucumber did its job commendably well, cooling the soft house bread and tasting bright and summery. The only problem I had with the house salad "Esme" was that I wasn't sure how to eat it. Chopped and crushed and ground down so much (I watched them do it) it had turned into a kind of Turkish gazpacho, and the flat plate it came on was hugely impractical. 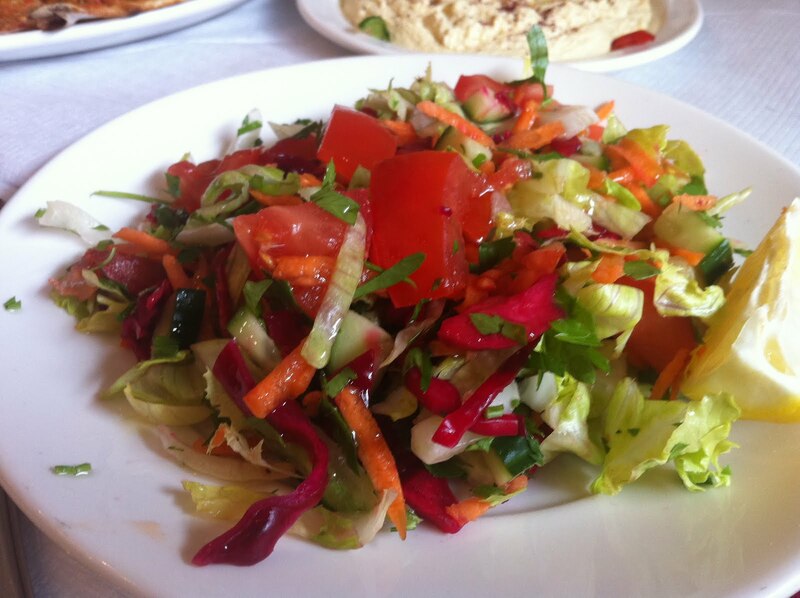 But, needless to say, it was seasoned well, tasted great, and was a lovely colour from the tomatoes and fresh parsley. 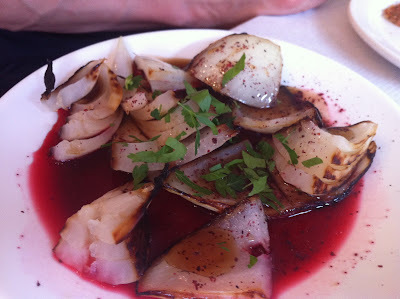 And while perhaps not quite up there with the version at FM Mangal in Camberwell (and I doubt anything ever could be), the pomegranate and onion pickle was still hugely addictive. 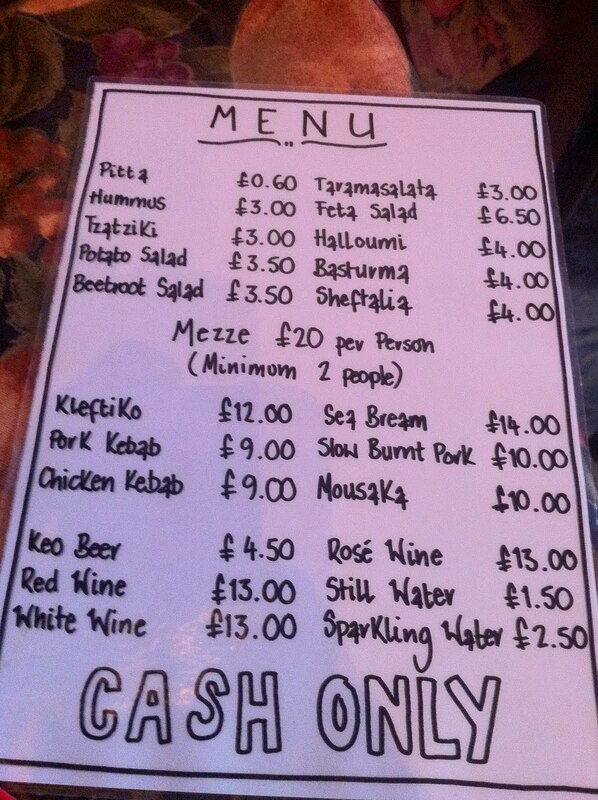 The Esme was £4 and the onion pickle was free. Crazy. 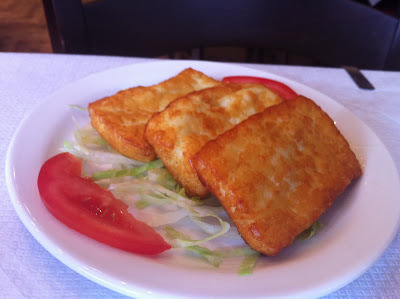 Deep fried I think rather than grilled, the halloumi wasn't 19NBC's greatest creation, but tempered with the onion pickle it had crunch and enough salty cheesy goodness to make it worth the effort. And around this time yet another free salad arrived, just a straightforward mix of tomatoes, lettuce, onion and cabbage dressed in olive oil and parsley but still, they went to the effort of making it for us and didn't even charge. The generosity of spirit is heartwarming. Lamb behti kebabs came served on house bread soaked up the meat juices and soft brown rice. The kebabs themselves were top-drawer, moist and rich and seasoned perfectly, and there was a huge amount of meat here for £9.50. Part of the reason our bill was so low could have been that this was the only significant meat dish we ordered, but as it was midsummer (and 19NBC has no air conditioning, so be warned) we didn't really feel like anything too heavy. 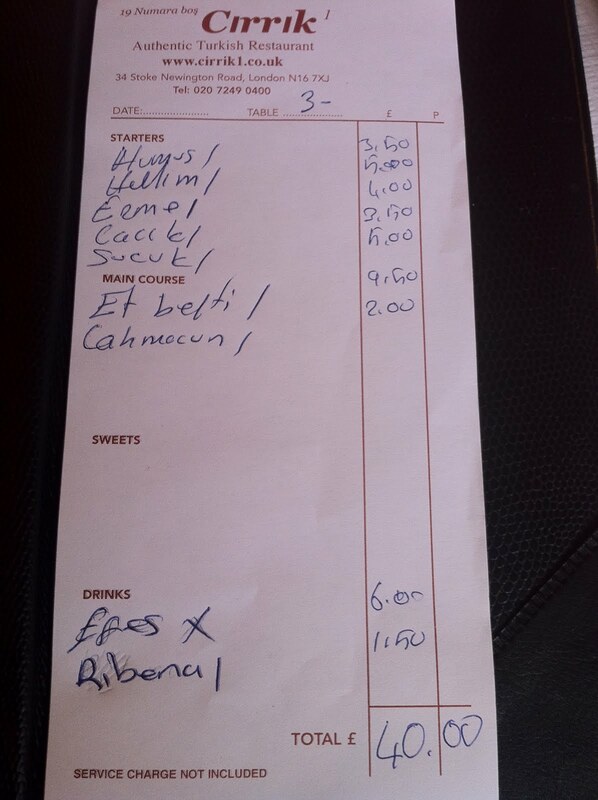 With two beers, a Ribena (don't ask) and as much iced tap water as you could want, the bill came to just £40 for 4 people. All four of us left stuffed, happy and with kebab juice staining our clothing (well OK that might have just been me) and with nothing, other than perhaps the raging heat, to complain about. 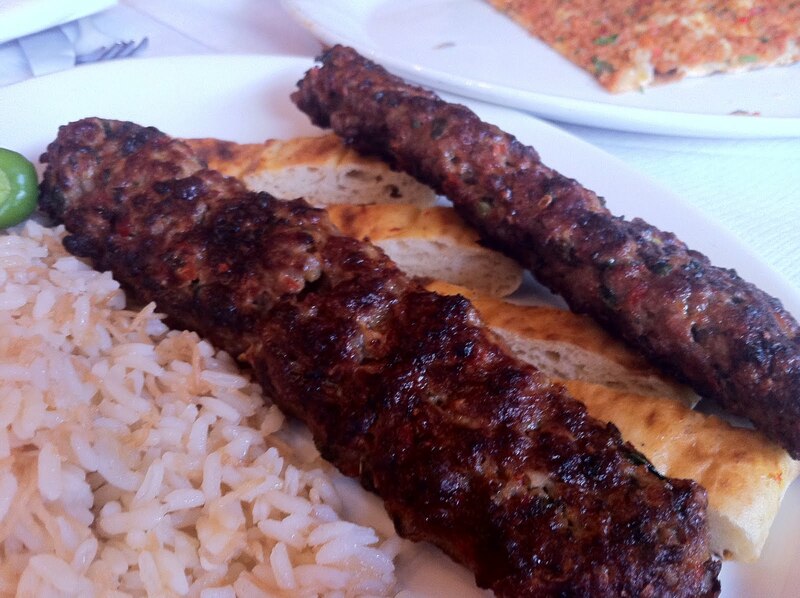 It is hard not to get complacent when you're tucking into another great Turkish grill and paying a pittance for it, but the astonishing quality and value of so many of these places should not distract for a second from the effort and skill that must go into running them. 19 Numara Bos Cirrik I is Yet Another Great Ocakbasi, and I will never get bored of eating there.